In a shocking new report, poultry workers reveal the grim reality of life inside America’s poultry plants: they are routinely denied adequate bathroom breaks. Last fall, Oxfam released our report, Lives on the Line, and an immersive web site to share stories, photos and videos from US poultry workers—women and men who want you to understand what’s wrong with the industry and how you can help. We’ve been pressing hard since then: using our power as consumers to demand better working conditions from companies, encouraging federal agencies to expand their efforts, engaging with companies, filing shareholder resolutions—and more. And we’ve seen some signs of progress. However, while we kept up the drumbeat, and interviewed more workers, we repeatedly heard one issue at the top of their list of demands: bathroom breaks. Our latest report, based on months of research, exposes the routine denial of adequate bathroom breaks inside US poultry plants. Poultry workers struggle to cope with this situation. They urinate and defecate while standing on the line; they wear diapers to work; they restrict intake of liquids and fluids to dangerous degrees; they endure pain and discomfort while they worry about their health and job security. And they are in danger of serious health problems. The situation strikes women particularly hard. They face biological realities such as menstruation, pregnancy, and higher vulnerability to infections; and they struggle to maintain their dignity and privacy when requesting breaks. Raise your voice on social media and demand that Tyson Foods, the largest poultry producer, provide adequate bathroom breaks to workers. On May 11, Oxfam and allies will be taking action at the Tyson Foods headquarters in Arkansas. We’ll be rallying out front, and then heading into the building to deliver the petitions from well over 100,000 supporters like you who have taken action and demanded that Tyson and other poultry companies treat their workers with the respect they deserve. Even though Tyson says it guarantees as-needed bathroom breaks in its “Bill of Rights,” supervisors impose restrictions that make it nearly impossible to use the facilities. 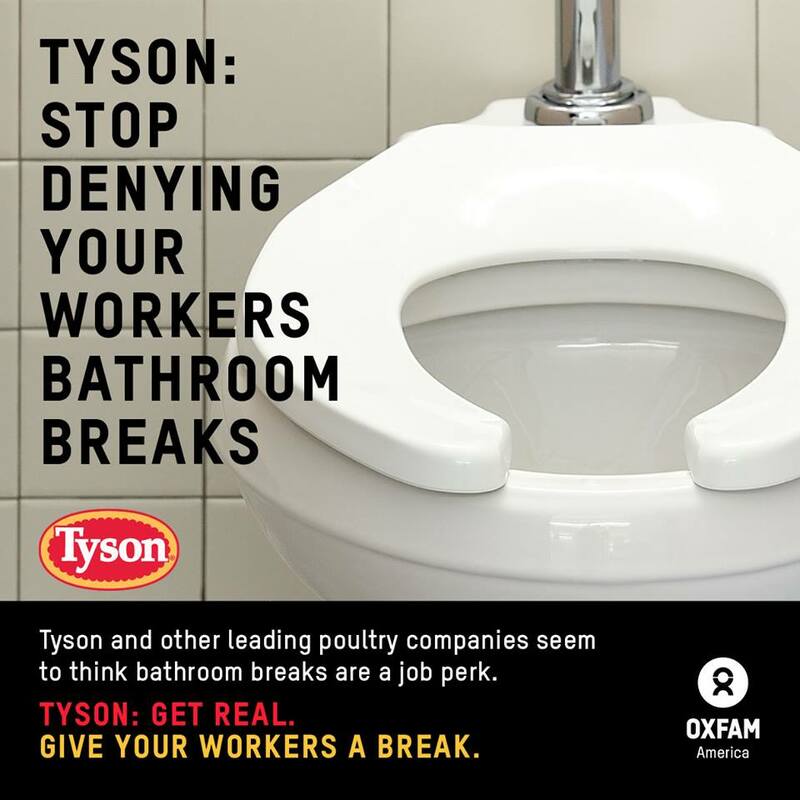 The top four companies—Tyson Foods, Pilgrim’s, Perdue and Sanderson Farms—should lead the way in ensuring that workers have bathroom breaks necessary to stay healthy, safe, and dignified at work. Make these policies public, submit policies to monitoring and verification by independent organizations, and make results of audits public. Raise your voice today to help secure bathroom breaks for poultry workers.